Tony Hancock was regarded as the best radio and television comic of his era. A man whose star burned brightly in the eyes and ears of millions before his untimely death. This is the first fully authorised account of his life. Tony Hancock was one of post-war Britain's most popular comedians -- his radio show 'Hancock's Half Hour' would clear the streets as whole families tuned in to listen. His peerless timing and subtle changes in intonation marked Hancock out as a comic genius. His character 'Anthony Aloysius St John Hancock' was an amplification of his own persona, a pompous prat whose dreams of success are constantly thwarted. The original British loser that we recognise in Victor Meldrew and Alan Partridge. Wonderfully supported by a cast including Sid James, Hattie Jacques and Kenneth Williams, and working with scripts from Ray Galton and Alan Simpson, Hancock became a huge star. The show was commisioned for TV, showcasing his talent for hilarious facial expression, and he became the first British comedian to earn a thousand pounds a week. Behind Tony Hancock's success however hid the self-destructive behaviour that plagued him all his life. Prone to self-doubt, and wanting to be the star of his own show, he got rid of James, and finally dismissed Galton and Simpson who had created the platform for his success. His private life was wracked by his ever increasing alcoholism and bouts of depression, and his relationships shattered by his capacity for violence. His ratings fell and, feeling washed up and alone after divorcing his second wife, he committed suicide in an Australian hotel room in 1968. 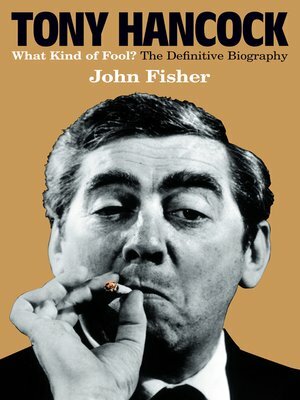 Now, forty years after his death John Fisher explores the turbulent life of a man regarded by his peers as one of the greatest British comics to have ever lived.